Silver-tone stainless steel case with a silver-tone stainless steel bracelet. Fixed silver-tone stainless steel bezel. Silver dial with black hands and index hour markers. Minute markers around the outer rim. Dial Type: Analog. Luminescent hands and markers. Date display at the 6 o'clock position. Omega Calibre 8800 automatic movement with a 55-hour power reserve. Scratch resistant sapphire crystal. Screw down crown. Round case shape. Case size: 38 mm. Band width: 19 mm. Water resistant at 500 meters / 1650 feet. Functions: date, hour, minute, second, co-axial escapement, chronometer. Luxury watch style. Watch label: Swiss Made. 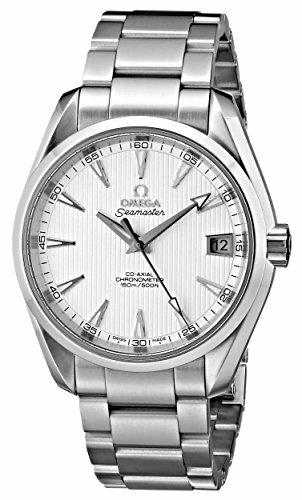 Omega Seamaster Aqua Terra Automatic Chronometer Watch 220.10.38.20.02.001. Stainless steel case with a stainless steel bracelet. Fixed stainless steel bezel. 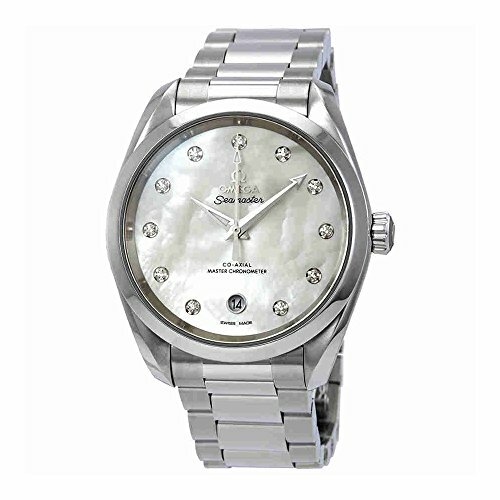 White mother of pearl dial with luminous silver-tone hands and diamond hour markers. Dial Type: Analog. Luminescent hands. Date display at the 6 o'clock position. Omega calibre 8800 automatic movement with a 55-hour power reserve. Scratch resistant sapphire crystal. Screw down crown. Transparent case back. Round case shape. Case size: 38 mm. Band width: 19 mm. Fold over clasp with a push button release. Water resistant at 150 meters / 500 feet. Functions: date, hour, minute, second, co-axial escapement, chronometer. Luxury watch style. Watch label: Swiss Made. 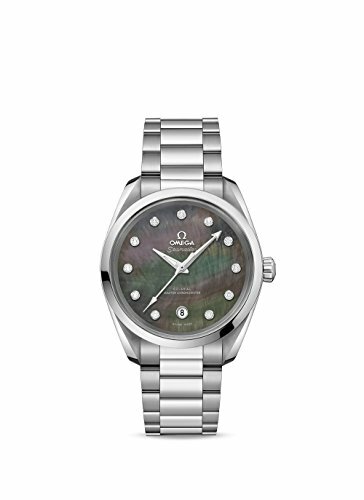 Omega Seamaster Aqua Terra Automatic Chronometer Diamond Ladies Watch 220.10.38.20.55.001. Silver-tone stainless steel case with a silver-tone stainless steel bracelet. Fixed stainless steel bezel. Black dial with silver-tone hands and index hour markers. Minute markers around the outer rim. Dial Type: Analog. Luminescent hands and markers. Date display at the 6 o'clock position. 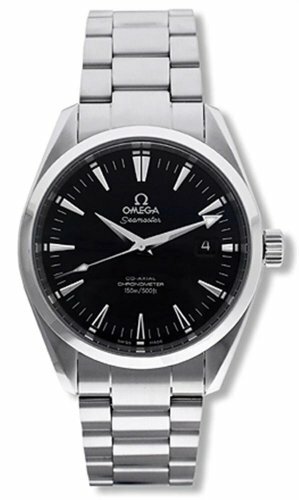 Omega Calibre 8800 automatic movement with a 55-hour power reserve. Scratch resistant sapphire crystal. Screw down crown. Case size: 38 mm. Round case shape. Band width: 19 mm. Water resistant at 150 meters / 500 feet. Functions: date, hour, minute, second, co-axial escapement, chronometer. Luxury watch style. Watch label: Swiss Made. 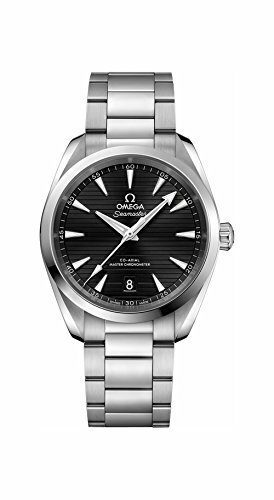 Omega Seamaster Aqua Terra Automatic Chronometer Watch 220.10.38.20.01.001. Silver-tone stainless steel case with a silver-tone stainless steel bracelet. Fixed silver-tone stainless steel bezel. Grey mother of pearl dial with silver-tone hands and 11 diamond set hour markers. Dial Type: Analog. Luminescent hands. Date display at the 6 o'clock position. Omega Calibre 8800 automatic movement with a 55-hour power reserve. Scratch resistant sapphire crystal. Screw down crown. Round case shape. Case size: 38 mm. Band width: 19 mm. Deployment clasp. Water resistant at 150 meters / 500 feet. Functions: date, hour, minute, second, co-axial escapement, chronometer. Luxury watch style. Watch label: Swiss Made. 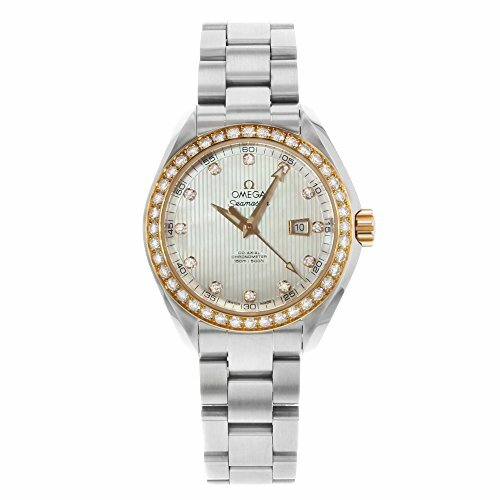 Omega Seamaster Aqua Terra Automatic Chronometer Diamond Ladies Watch 220.10.38.20.57.001. Stainless steel case with a stainless steel bracelet. Fixed 18kt red gold bezel set with diamonds. Mother of pearl dial with red gold hands and diamond hour markers. Minute markers around the outer rim. Dial Type: Analog. Luminescent hands and markers. Date display at the 3 o'clock position. Automatic movement with a 50 hour power reserve. Scratch resistant sapphire crystal. Screw down crown. Transparent case back. Case diameter: 34 mm. Case thickness: 13 mm. Round case shape. Band width: 16 mm. Deployment clasp. Water resistant at 150 meters / 500 feet. Functions: date, hour, minute, second. Luxury watch style. Watch label: Swiss Made. 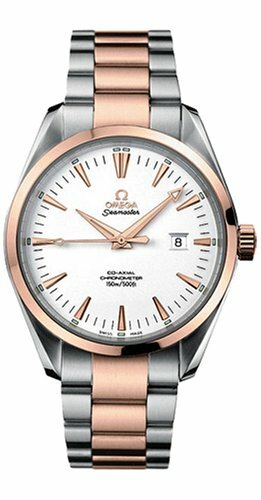 Omega Seamaster Aqua Terra Teak Automatic Mother of Pearl Diamond Dial Stainless Steel Ladies Watch 231.25.34.20.55.003. 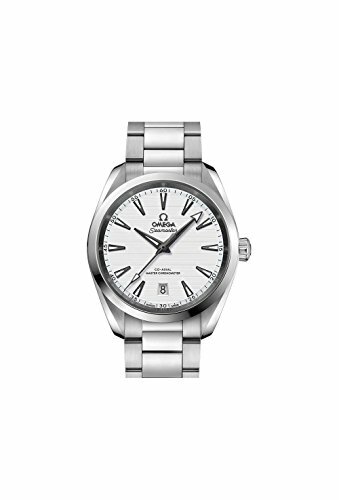 Just like a luxury sportscar, the Aqua Terra men's watch by Omega boasts high-class style and unparalleled performance. Stainless steel and 18-karat red-gold combine beautifully in this modern design. Inside the 39-millimeter case is a silver dial complete with a date display at three o'clock and indexes for hours, minutes, and seconds. Powered by automatic movement, this esteemed timepiece also features a rhodium-plated co-axial escapement and a scratch-resistant sapphire dial window. The Aqua Terra is water resistant to a depth of 500 feet. 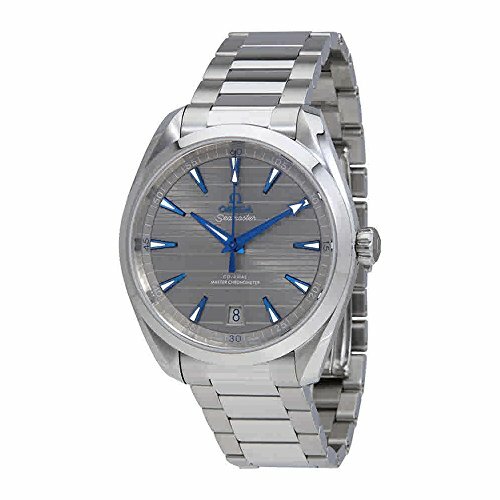 Looking for more Omega Seamaster Aqua Terra Chronometer similar ideas? Try to explore these searches: Orchid Glass Art, Rbz Rubbed Bronze Chandelier, and Watermelon Buckle.